The classroom has changed dramatically over the last 20-30 years. From the big push towards the overhead projector to the first interactive whiteboards and now interactive touchscreens, the way we share teaching materials with our students has shifted significantly. Ultimately though, these innovations have been in service of only one thing – helping kids learn more effectively. For the individuals tasked with buying new technologies for their schools though, the endless parade of ‘innovations’ can become tiresome and – if you’re not careful – extremely expensive. All of which might have you asking why you should buy visualisers for your educational establishment? A visualiser is perhaps best described as a modern version of the now old-school overhead projectors. However, whilst overhead projectors required teachers to print out special sheets of plastic with information printed on them, visualisers allow teachers to show anything at all, in real time, on the big screen at the front of their classroom. By leveraging modern digital camera technology and the fact that most classrooms now have data projectors or large touchscreens, visualisers, provide a live video feed of what’s placed underneath them, allowing for more than just pre-printed sheets to be shared. Why should you buy a visualiser? Visualisers open up demonstrations to the entirety of the class, regardless of their position in the room or the size of the objects you’re manipulating. By using a visualiser you can showcase extremely small details, like certain passages of a book, or the specifics of a science experiment, without worrying over overcrowding or students missing out on details because they can’t see them. They allow teachers to share things which, otherwise, wouldn’t be possible. Take, for example, an art class. The techniques required to effectively create certain styles are often taught on a one-to-one basis because students need a close-up view to understand what the teacher is doing. With a visualiser, a teacher can place their paper, hand and tool under the camera arm and show the entire class at once exactly how to create the effect. Visualisers are small and cost-effective, making them suitable for every classroom. Because most models are little more than a camera attached to an arm, attached to a small base, they fold up quickly and easily. Because visualisers are digital, they’re capable of advanced features which you won’t find on, say, an overhead projector. Most feature digital zoom for detailed close-ups, whilst others feature microphones to amplify your voice and the ability to freeze and split the screen, displaying more than one thing at once. 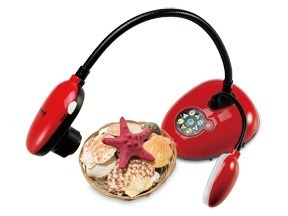 The simple, universal connectivity options on a visualiser make them suitable for virtually any classroom. Requiring little more than a free USB port, you can hook your visualiser up to a desktop, laptop, projector or even directly to a screen, should the function be supported. Those are just a handful of the reasons why visualisers are the ideal choice for the modern classroom. To learn more, get in touch with us today, we’re happy to help! Previous PostDifferent Types of Projector Screen – Explained! Next PostWhy Choose a Wireless Microphone?